Here is a “two-fer” of some ’90s rock that may have slipped by your musical radar completely. Fronted by ex-Uriah Heep and long-time Lucifer’s Friend vocalist John Lawton, these rare slices of British vinyl are presented here for the first time as a double CD. One Over the Eight was released in 1995 and the out-of-print Nightheat came out in 1997. Both albums reflect the times in terms of production and song styles but received a modern up-to-date sheen that gives each a very relevant and radio-ready sound. One Over the Eight is a nice overview of originals and covers that define classic rock and soul. Lawton is a singer’s singer and draws a line in the sand from the get-go with a deep cut by Whitesnake called “Walking in the Shadow of the Blues.” That’s followed by a passable, yet effective take on Lennon/McCartney’s “Eleanor Rigby.” The covers keep on coming strong, with a soulful showcase for Lawton’s voice on Bill Wither’s “Aint’ No Sunshine.” Guitarist Riki Robyns’ slightly metallic tone digs deep into cuts like “Better By You, Better Than Me” and Rainbow’s “Stone Cold.” They also write some fairly strong ballads as well on tracks like the ethereal “Angel.” All in all, this particular release comes off like a band that cut its teeth on the pub rather than arena or concert circuit. Nightheat bumps things up a notch or two, with more effective production as well as songwriting. The band kicks this one off appropriately with an up-tempo rocker by Lawton called “Don’t Stop Believing.” Bad Company’s “Ready for Love” follows and is certainly in their wheelhouse of moody and hook-filled classic rock. “Nobody Loves You the Way I Do” is dramatic in a John Waite/Paul Rodgers/David Coverdale kind of way. Rousing rockers like “Don’t Look Back” and “Any Day Now” are nice blends of heavy rock and hook-filled soul. Also, one would be remiss not to mention Lawton’s brilliant and heart-wrenching take on the perennial “When a Man Loves a Woman.” He sings the you-know-what out of that song! If you’re looking for real rock and roll that delivers a good balance of strong originals and quality covers, you would be well-served to check out this two album compilation. 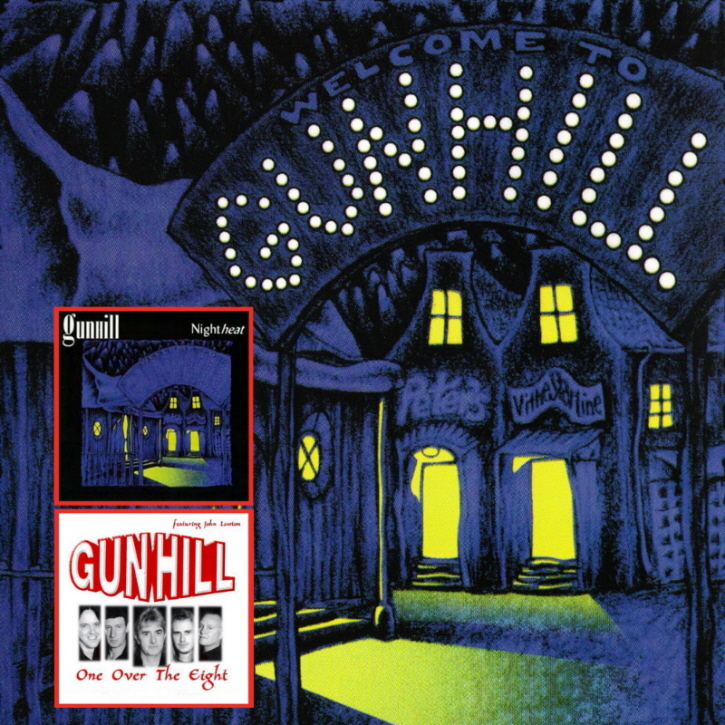 Understandably, GunHill may be a name that, for decades, has been only familiar to European audiences, but now everyone can enjoy these gems of really fine British rock that still resonate and hold up under modern digital scrutiny. This entry was posted in Album Reviews and tagged Album Review, Eric Harabadian, GunHill. Bookmark the permalink. Awesome I’d never heard of these guys! Do they have more originals I can check out?